GUYS. This is possibly the best smoothie I’ve EVER made and if you follow me on instagram then you know that I’ve been making a LOT of smoothies lately. I’ve honestly never been much into mangos but I decided to try them in this smoothie and I’m newly OBSESSED. It’s not that I didn’t like mangoes before; I think I just never really gave them much thought. But, lets back track a bit. 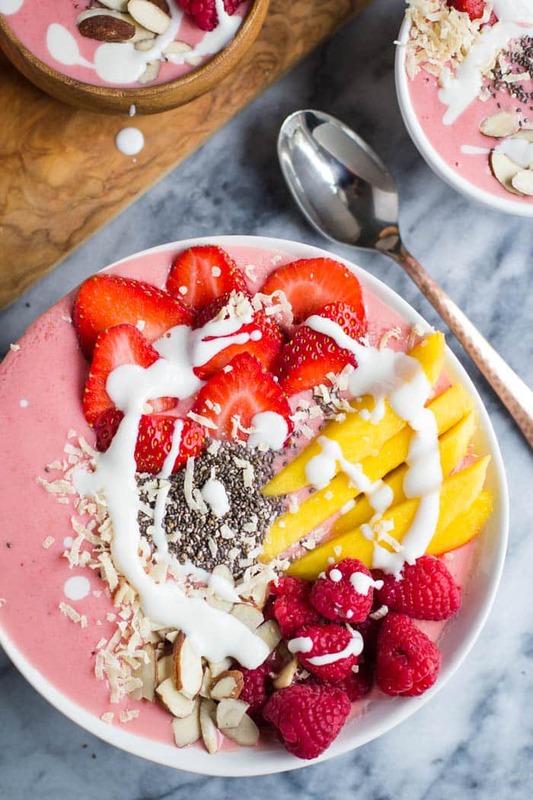 Up until creating this smoothie, I spent YEARS making fun of smoothie bowls. They seemed silly and unnecessary to me. Why put it in a bowl, requiring a spoon, when you could just put it in a to go cup that you could take anywhere with you?? I just didn’t get it. 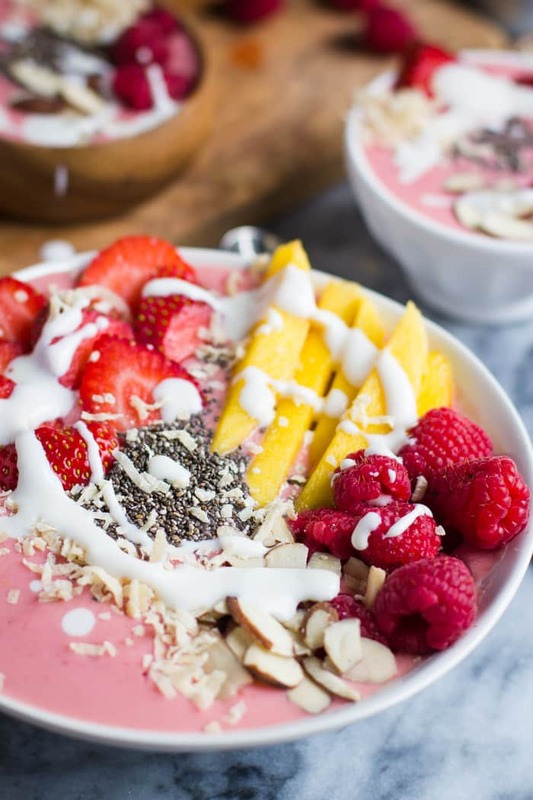 But after making this Tropical Berry Smoothie Bowl, I TOTALLY get it. 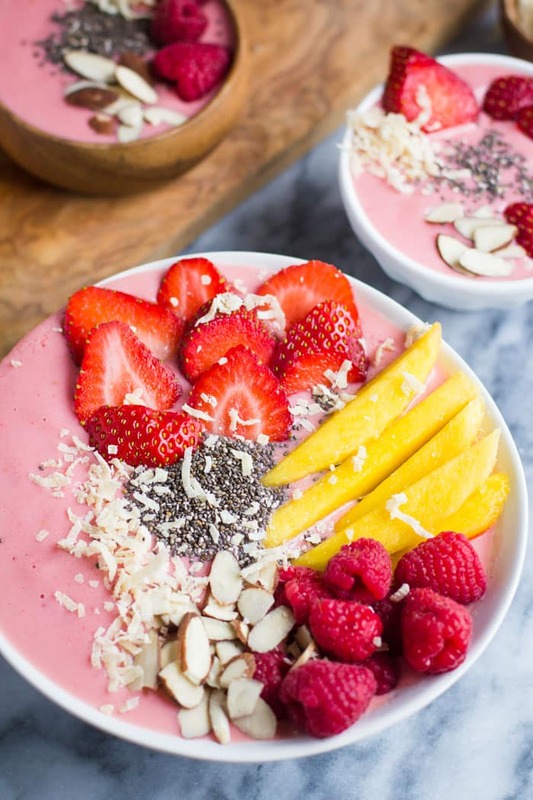 Here’s the deal with smoothie bowls: you can add lots of other yummy things to the mix like big chunks of fresh fruit, nuts, seeds, and (in this case) some shaved coconut. I also drizzled a bit of vanilla greek yogurt across the top because 1) YUM! and 2) Lets be honest, it just looks a little prettier. 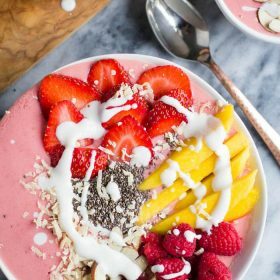 So, this tropical smoothie bowl is topped with chia seeds, strawberries, raspberries, mango (!! ), almonds, and shaved coconut. Basically it’s a big bowl of deliciousness that you NEVER want to end. (I made a ridiculously large batch of it so it kind of seemed like it would never end…. for a few days). 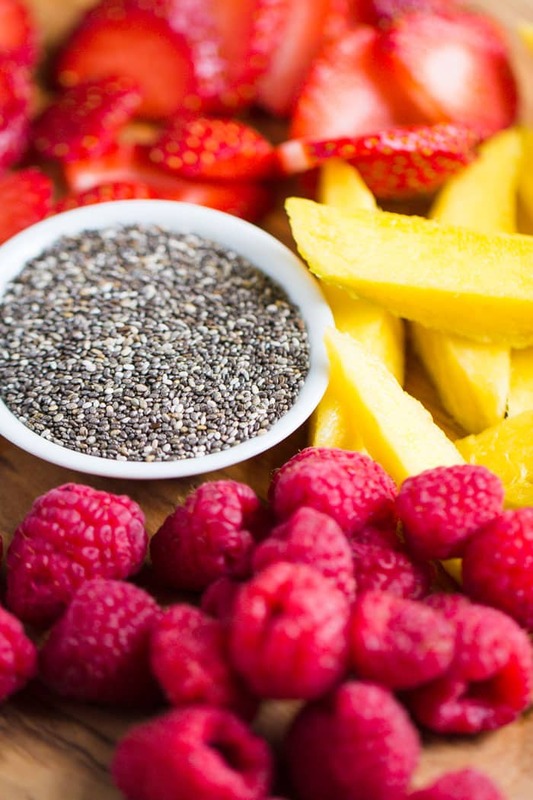 You know how this whole smoothie thing goes: add all of the ingredients into a blender. Blend. Serve. We’ve done this part a few times. Only difference is that we’re putting it in a bowl this time. 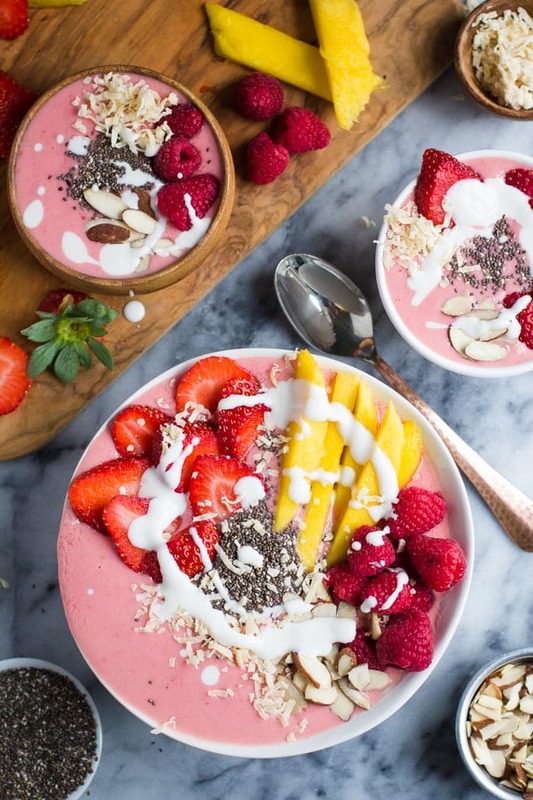 Then we’re going to top that smoothie bowl with lots of yummy things like fresh strawberries and mango and raspberry and all of those other yummy things that I already mentioned. The almond slices I especially like because it gives the smoothie a delightful crunch in every few bites. 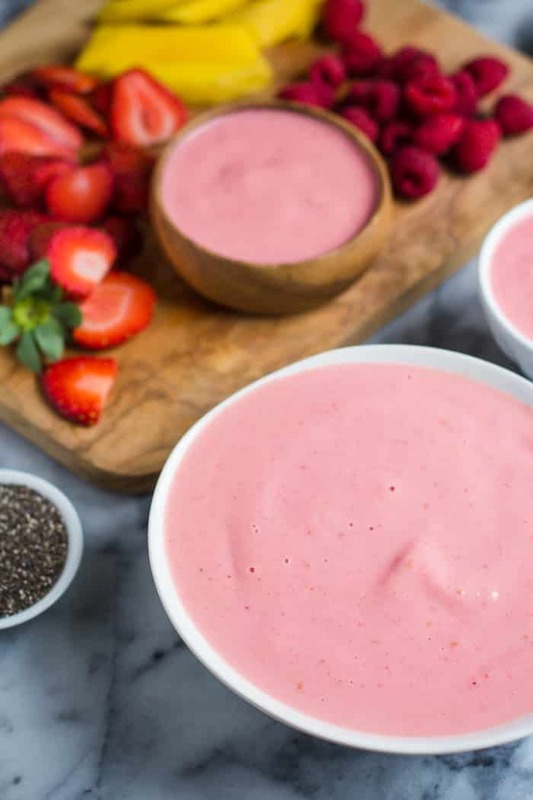 And finally, in a step that’s totally unnecessary but also necessary, we drizzle a bit of greek yogurt over top of the smoothie in a circular fashion. I actually mixed the greek yogurt with a tiny bit of almond milk to make it a little more pourable. Combine all of the smoothie ingredients and blend. Top of fruit, nuts, seeds, or whatever else your heart desires. Drizzle with the greek yogurt. 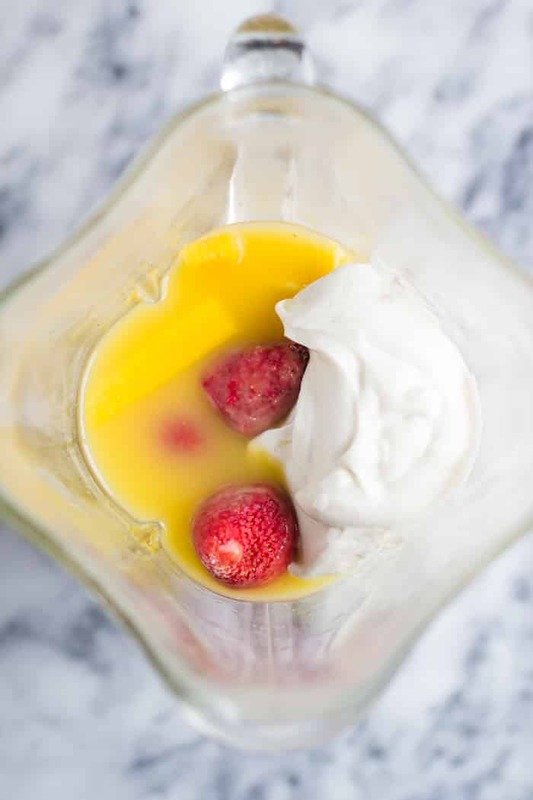 whisk together greek yogurt and almond milk. I just discovered your blog yesterday, and I’m loving it so far. 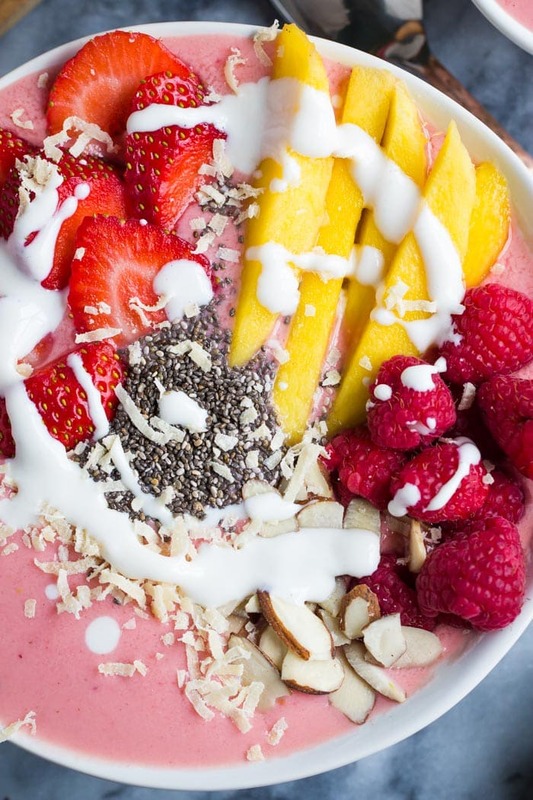 This smoothie certainly looks amazing. I visited Puerto Rico last March and there was a little place that had these things called “Acai Bowls”, which is really similar, only instead of the smoothie base, it’s Acai. They were so GOOD, and I always wanted to replicate them, but Acai is so expensive where I live, so perhaps this will be a good substitute! How long have you been a food blogger? I just started my blog yesterday, haha. Your photography is beautiful, and you have some great recipes here! I’m glad to have discovered your blog! I’ve been blogging for about 2.5 years now and still feel like I have SO much to learn. I’ve focused much of my energy on improving my photography and have even used that to start a side food photography business. If you ever need anything, shoot me an email!